Chances are your organization has an assortment of desktops, laptops, and servers. As an organization grows, and these machines multiply, managing them all can become a major issue. OptiTune offers one of the best solutions to date. It has been precisely designed to maximize efficiency and simplicity of IT management in any size operation. It allows you to take control of all computers within your organization, making sure each has the most current updates, exposing malware infestations, deploying the latest version of applications like Microsoft™ Office, and identifying which computers are overloaded. OptiTune provides all these options, and more. OptiTune goes where you go. Since it runs in the cloud, it can always be accessed wherever you have internet access, and from any device. It doesn't matter whether you have an iPad, iPhone, Android Phone, Blackberry, PC, or Mac - you can access OptiTune with any of these devices. Similarly, computers managed with OptiTune need not be on the same physical network, as long as they have internet access. It does not matter if the user you are trying to assist is across the hallway, at home, or in a hotel across the globe, the OptiTune remote assistance & remote connect software is designed to seamlessly work through the most restrictive firewalls and networks. 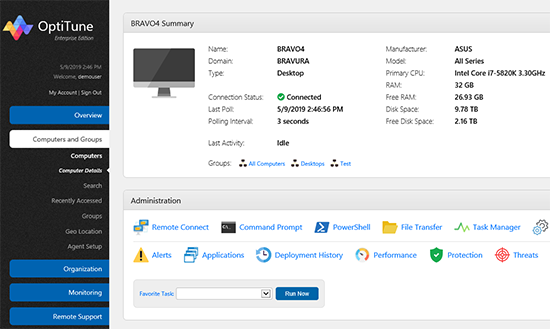 OptiTune's Remote Connect feature lets you connect to any computer in your organization and control its desktop with your keyboard and mouse. All that is required is an internet connection. Remote Connect does not require a user to be present at the remote computer, or firewall ports to be opened (great for connecting to servers). While other IT Management solutions charge thousands of dollars for their remote connection functionality, OptiTune includes remote assistance & remote connect at no extra charge, and places no restrictions on the number of operators or concurrent sessions. Stay ahead of serious problems in your IT environment with OptiTune's monitoring and alerting functionality. When something important happens in your IT environment, OptiTune can notify you via email or text message right away before things get out of hand. Prevent a serious malware outbreak from spreading across your network, or see when a server goes down. These are a few of the events OptiTune can automatically monitor. With over a hundred unique events provided, you can decide what to be notified about, and when. You can even create your own custom events. If your organization has multiple IT work shifts, you can setup notification groups for each one, and specify the weekly schedule for which group of administrators should be notified when. OptiTune lets you customize the email template used to include your own company's branding, and choose the format of the notification email, even down to how each alert is is formatted. 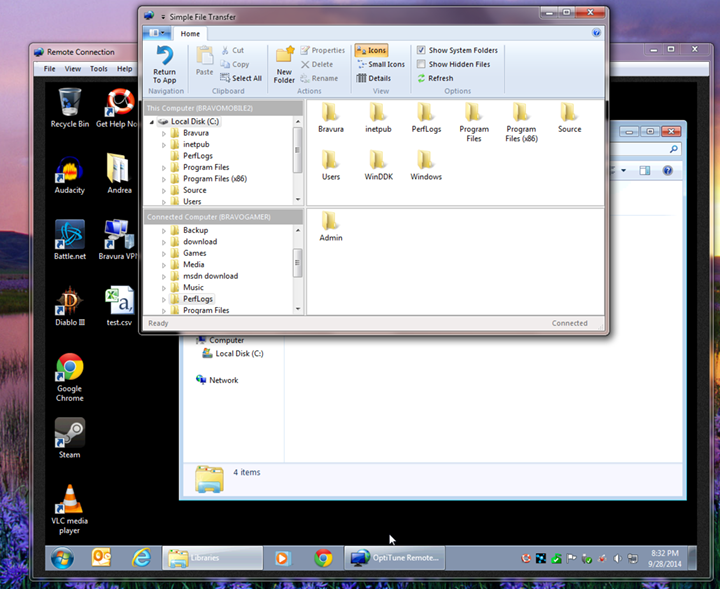 Managing Windows Updates can be tedious and time consuming. Questions necessarily arise. For example, which computers require updates, and which updates, and when should they be installed, and have any updates failed to install? OptiTune streamlines this process by providing detailed graphs and breakdowns on the update status of each computer, and then listing the various types of updates that are available. OptiTune, unlike other management solutions, frees you from the unpleasant task of sifting through a list of 6,000+ updates to select the relevant ones, or manually approving new updates as they are released. Instead, you may delegate this task to OptiTune, setting the update filters you need, and letting OptiTune handle the updates. Identifying malware infestations before they take root and spread throughout the network is essential. 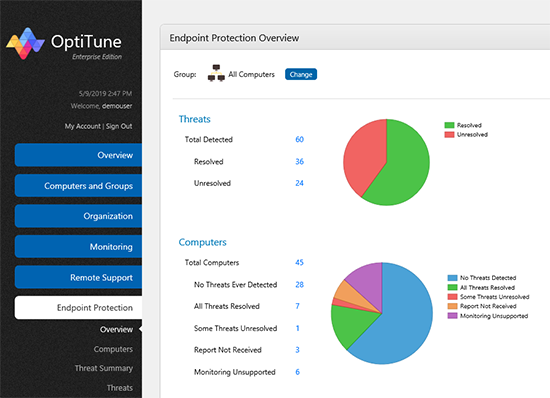 The OptiTune console provides a centralized place to monitor and fix malware. It integrates with popular anti-virus applications to provide the latest data on malware infections for all computers, and allows you to schedule quick or full scans, and signature updates. In organizations both large and small, knowing if you have a malware infection is essential. Don't be in the dark anymore. OptiTune integrates with popular anti-virus applications to give you up to date information on malware infections for all your computers. You can schedule quick or full scans, signature updates, and so forth. Know when a malware infection is starting, and take action before it spreads across your entire network. 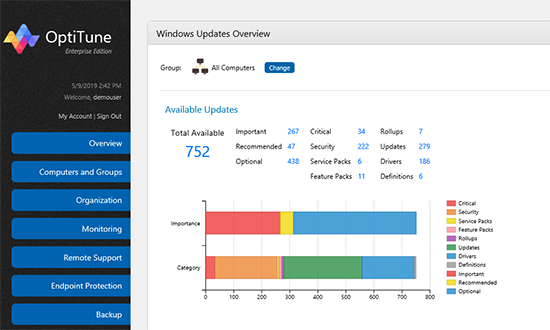 The OptiTune management console gives you a centralized place to monitor and fix malware. OptiTune allows you to automatically deploy applications to the computers you select, according to the schedule you define. This applies to remote locations as well as to mobile workers who rarely come to the office. Any application which has an installer can be deployed with OptiTune. OptiTune supports the latest installer technology, including the Windows Installer (MSI), as well as custom installation programs. There is no longer any need for expensive “application repackaging” when using OptiTune since it does not require an MSI installer, nor does it even require an end user to be present. An added feature is that uninstall and repair operations are fully supported. Should a user have problems with one of the applications, an MSI repair of the application using OptiTune can be scheduled. 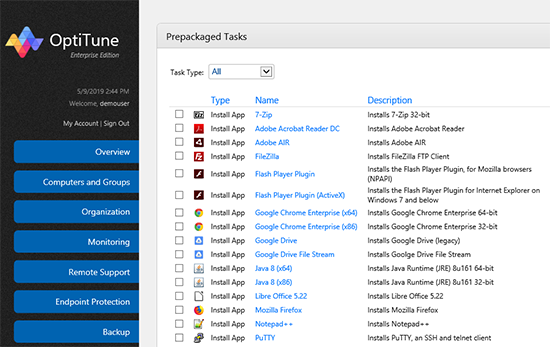 OptiTune saves you time when deploying commonly used applications (such as Google Chrome), as it provides pre-packaged applications for deployment. Just find the application you are interested in deploying, and click "Import", and you can deploy such applications quickly and easily. When you have servers to manage, one of the key questions you might ask is "Which servers are overloaded?". Let OptiTune find the answer. 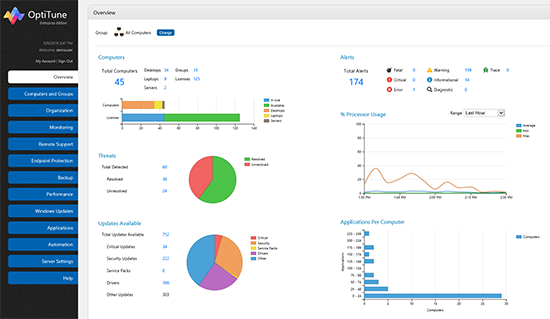 OptiTune includes a powerful monitoring component that provides highly detailed performance information on all computers in your organization. 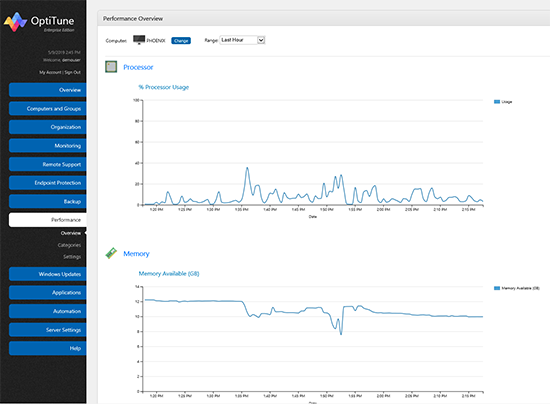 Know what times of day CPU usage and disk activity are highest on your servers. Or find out which desktop computers need more RAM, using actual data, not guesswork. With OptiTune, you can view detailed graphs for all of these areas of performance. You can even see aggregate charts of performance data, to view the combined performance for a group of computers. When your company starts to grow, keeping track of all the different computers in your organization can become a serious problem. You may be asked to answer questions like: How many model X laptops do we really have in use? Or, how many copies of application Y do we have installed throughout the company? Let OptiTune do your inventory for you. It will fully catalog all hardware details and installed applications for every computer in your organization. Unlike other management solutions based in the cloud, with OptiTune you get the choice of how and where to host your management server. 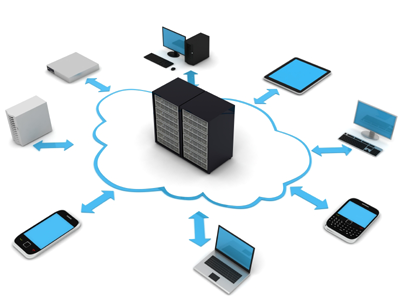 Most customers will choose to use the OptiTune servers in Bravura Software's professionally managed cloud, at https://manage.opti-tune.com. This option is free for all customers, including those using the free OptiTune trial. However, if you prefer to run the OptiTune management server on your own hardware, or on another cloud service, like Amazon EC2 or Windows Azure, you are free to do so. You can even run the server entirely behind your own firewall. If you choose the host the OptiTune management server yourself, it requires Windows Server 2016 and Microsoft SQL Server 2017 Express Edition. Great IT management software doesn't need to be expensive. With OptiTune, you don't have to compromise. OptiTune is FREE for 30 days (for up to 100 computers), and only $1.95/month per computer afterwards. Volume Discounts are also available.